Annyeong! I have been on and off lately. I have been wanting to film a Vlog but I haven't muster the courage to, so for the mean time I will still be sharing my thoughts here instead. Hopefully I can do it anytime soon, please anticipate! During this rainy season, one of my favorite brands, Silky Girl sent me a parcel containing their best products! 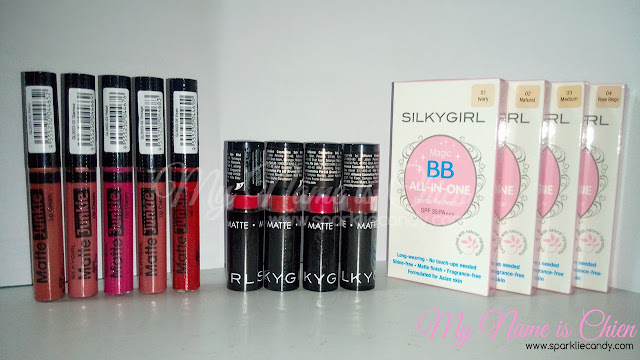 As a recap, Silky Girl is a brand name launched in June 2005 which offers a complete range of high quality cosmetics with a brand personality of fun, young and confidence. This brand is said to originate from Malaysia as contrary to what I know before that its from Indonesia (my bad, sorry for that). Apart from makeup they also have women and men fragrances. This kissproof and transfer resistant lipcolor applies like a liquid lipstick that dries to a matte finish. It stays on your lips through day and night activities requiring minimal touch-ups. This new and improved formula of Magic BB All-In-One Powder Foundation comes with these 4 natural ingredients; Wild Mango Butter, Calendula Flower Extract, Sakura and Mulberry Leaf Extract to keep skin looking flawless all day. Also formulated with Powder La Vie and Silica to absorb excessive sebum for a shine-free, matte finish that lasts all day. Available in these 4 shades. I am very excited with these beauty products and I am currently using them already, review for the lip products will be released this week. Thank you so much Silky Girl! I have a lot of going on lately and I have been procrastinating so much. Anyhow I am all alive and kicking, thank you so much for reading my blog. I really look forward to post a lot. See you in my next posts lovely!